Remember the feeling of breathing underwater for the first time? The freedom, the weightlessness, the smile on your face! Together with our partner PADI 5-Star IDC Centre, Pleasure Divers on Magnetic Island, we offer the chance to share that experience with other people. As a PADI Open Water Instructor you'll have the skills and knowledge to teach others to enjoy the underwater world as much as you do. PADI Instructors are highly sought-after globally and the job opportunities are endless. 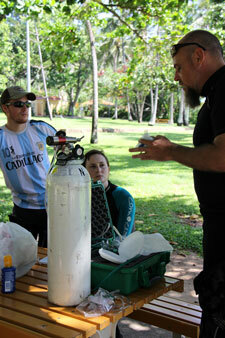 The PADI Open Water Scuba Instructor course builds on the PADI Assistant Instructor course. It can be done as a separate course, after having been certified as an Assistant Instructor (AI), or more commonly, is combined with the AI course in our ten day Instructor Development Course (IDC). The PADI Open Water Instructor course is an investment in your future. It opens up limitless travel opportunities, and allows you to teach divers of all levels, from complete beginners up to Divemasters. You will become fluent in PADI's System of education through a combination of theory, confined water and open water teaching practise. Upon successful completion of PADI's two-day Instructor Examination (IE) you will have earned the most coveted Instructor rating in the dive industry. Whether you're looking for a new career allowing you to do what you love every day, or simply want to become the best diver you can be while being able to supplement your income at the same time, there's no stopping you.